Worldwide Ace » Cup or Cone? Though items like gellatto (frozen fruit parfait) and snow cones existed dating back to Roman times, the history of ice cream is unclear. Several myths claim Marco Polo discovered it in Italy in the 1200s and brought the recipe back to Italy. From there, Catherine de’Medici brought the recipe to France when she married the Duke of Orleans in the mid 1500s. Eventually, English king Charles I discovered it and, being the snob that he was, gave his chef a lifetime pension to keep the recipe secret and just for royalty. Of course, his beheading in 1649 meant the recipe wasn’t secret any longer. None of these mythos can be proven, so we’re left with an unknown origin. What we do know is that in the 1700s, a French book with several recipes was published, marking the first tracable history of ice cream. Dolly Madison served ice cream at her husband’s inaugeration in 1813. Nancy Johnson of Pennsylvania developed the first hand cranked ice cream maker in 1847 (she even had a patent). 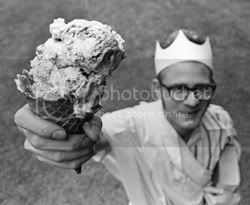 Commercial production of ice cream began in 1851 in Baltimore (at least in North America). Ah, ice cream. There’s no use being frozen with fear, since it’s the cream of the crop. Dairy ask what it’s origins matter? If some sundae you’re craving Carvel or Ben & Jerry, just enjoy it. That’s the lesson to be learned. I’ve always imagined myself settling down with the milk/icecream man– and driving around town in his truck. He sometimes lets me wear his hat. And I do enjoy ice cream, I must admit. It’s something I don’t eat often, but I love it and eat it when the urge strikes me. Anyhoo, I thought you were getting at learning about the nuances of flavor, or perhaps even learning to make ice cream. If only he were a zombie, he’d be your perfect mate.